Warning: there will be no puns upon the name of Pete Dye in this story. They have been depleted to the point of near extinction by other journalists. Let me start by saying something that may have already occurred to you if you’ve played many Pete Dye golf courses, such as famous and revered layouts like Teeth of the Dog, Sawgrass, and La Quinta. Which is: Good God, these courses are hard! And let me also add: Oh, My, these courses are fun! By all indications Pete Dye is the nicest of gentlemen, but that’s not necessarily the attribute he draws on when creating some of the most challenging and confounding and downright exhilaratingly difficult golf courses on the planet. Which is exactly why people of all abilities want to try them all. 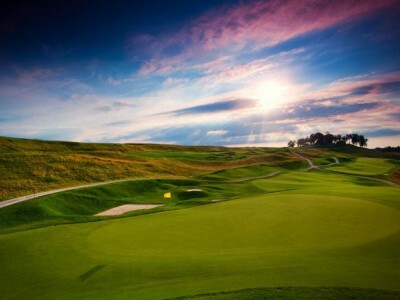 I once played Dye’s Whistling Straits layout in Kohler, Wisconsin with a group of other golf writers. 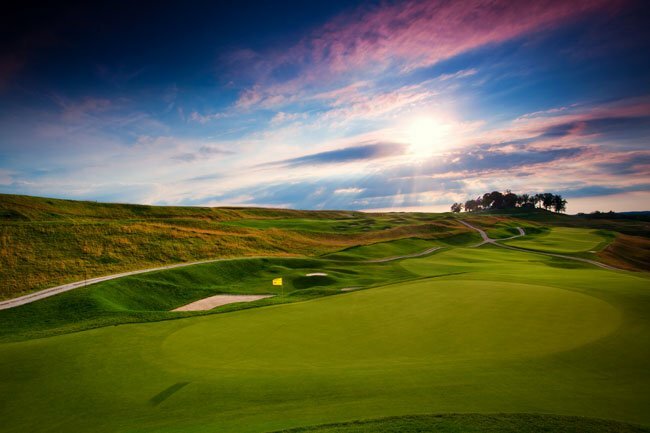 When we came off the eighteenth green– looking like we’d just completed the Death March from Bataan– the folksy Indiana gentleman himself happened to be standing up near the clubhouse. While I moved away to a safe distance, several other journalists went over and gave Pete a piece of their minds– or at least a piece of the little bit they had left. He remains among the most gracious people I’ve ever seen being berated and verbally pummeled by a cadre of exhausted hacks who had themselves, by all indications, chosen to play from the wrong set of tees. Psychologists tell us that anger is really just another, more painful side of love, which raises the question: do we really LOVE the rough treatment we receive at the hands of a penal golf course architect such as Dye? I’d rather raise the question than answer it but will admit that while there were moments while playing his golf course at Indiana’s French Lick Resort that I cursed his name with all the creativity I could muster, alternately I felt other moments of exhilaration that could only be described as, well, okay, love. And the fact that I shot 80 on what I was told was an impossibly difficult layout, only brings back to me the instances where I triumphed in the face of being forced to execute seemingly impossible shots from sidehill lies at the bottom of steep slopes to tiny greens perched atop further slopes bikini waxed to within an inch of their lives so that any shot not landing perfectly and stopping on the putting surface was sentenced to long and difficult adventures rolling farther and farther from the pin and requiring the deftest possible short game skills to come back anywhere within the good graces of even the remotest opportunity to make a miraculous bogey. And the journey involved in reading that sentence barely communicates the intricate devilry of playing one of Dye’s holes at French Lick. Which is why golfers keep coming back for more. 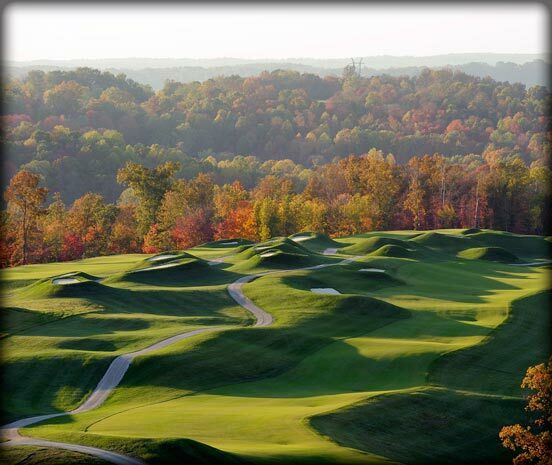 Despite both the psychological and downright physical demands of the track , every one of Dye’s golf holes at French Lick is simultaneously a stunning temptress. The course stretches langorously across shapely hills and valleys atop a plateau looking not just out on but DOWN upon miles of gorgeously thick Indiana hardwood forests. Bunkers assume every form imaginable from long strips running alongside narrow fairways to volcano tops of sand you’d best avoid even glancing at on the off-chance that said glance might open the potentiality in your mind that one of your tee shots could land in one. My one issue with the course concerned a couple of par fives that featured plateau fairways dog-legging around steep canyons. This challenge itself wasn’t my issue: it was that there were no visual lines to aim shots at, no way of knowing– if you were to confidently step up and perfectly execute the 190-yard layup you had in your mind– where said lay up should be targeted. Of course, I could have listened to my forecaddie– they are required on the Dye course for the same reason that you need to bring ropes when climbing Mt. Everest. But being stubborn and unruly, I tend to disdain the help of any outside agency when playing golf. And so on several occasions I hit exactly the shot I’d planned– even thinking to be conservative and cut off less crossing than I was sure I could make. Both times the visual trickery of the layout suckered me into leaving the shot down in the deep valley with untenable escape possibilities. While this would be more understandable on a members course where players would learn after a few failed attempts, it poses a huge challenge to most golfers who are most likely to play this resort course only once– even more so if they refuse the help of their forecaddie. Between you and me, I did in fact heed his advice to play the course from the white tees (around 6,300 yards). And let me just say that anyone attempting to take on the course from the hilarious 8,100-yard back tees should seek professional help. And I don’t mean a golf professional. Having now dutifully stressed the overt challenges and sometimes maddening adventures of the Dye Course I must also admit that I loved the day there, marveled at the shots that had been painstakingly set up for me (and against me), and the tiny greens that were actually among the fairest of all of Dye’s greens that I’ve played, even if the crazy humps surrounding them were sometimes too difficult to navigate. I loved the views of autumn-changing forests floating below the course and the way the golf holes really made the best possible use of the terrain. I loved that every hole presented a different kind of challenge, even when I wasn’t up to solving a particular golf puzzle that Pete put before me. My own personal regret in playing the course was not having the chance to play it again– perhaps lodging in between at the turn-of-the-century former Taggart mansion (belonging to long-ago French Lick Resort owner and Indianapolis Mayor Tom Taggart) which serves as clubhouse and also boasts four rooms upstairs. I’d particularly like another shot at the third hole on the Dye course, a short, reachable par five that would require a PH.D in something technical to figure out how to play it correctly. The paradox of the course– both its difficulty and sheer enjoyment– was summed up perfectly when our forecaddie remarked on one hole that it was the first time he’d ever repaired four fresh ball marks on a green that didn’t actually have any balls left on it.